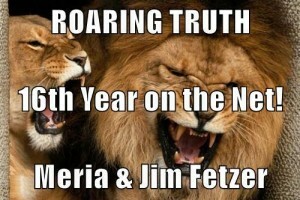 7/14/15 Roaring Truth with Meria and Jim Fetzer. Jade Helm starts tomorrow-no media allowed? ; El Chapo & Trump=distraction; FEMA camps;ISIS-American made like fake beheading videos;ISIS-McCain’s army;Scott Walker and Wisconsin;stolen re-election;stolen elections;Greece-EU;NAFTA & TPP; North American Union;Iceland jailed their bankers;top 1% bloodsuckers;Iran agreement-political theater-no nuclear ambitions;sanctions violation of international law;collective punishments;disarm Israel;JFK;USS Liberty;9/11-CIA, Neocons,DOD & Mossad; Jesus freaks in office;dual citizens;Jesus Camp and more. 4 Responses to "Roaring Truth with Meria and Jim Fetzer"
Iran, last year, agreed to export spent uranium enriched water of 5% maximum, which is way below a grade level to produce nuclear weapons. The current agreement is all about pinning the reserve petrodollar on its oil and natural resource export base, not nuclear bombs. Did WU-45 nuclear weapons stationed in the elevator shafts bring down the World Trade Towers? It most certainly was not a pancaking structural collapse! JH15 is much more than a drill. Alternatives point to it being an A.I. operation that will target the “highest risk” individuals of freedom for apprehension. Guns and food? Having lately seen for myself, groups of 3 Blackhawks flying slow and semi-low in both Scottsdale and Buckeye Arizona. And Arizona is a “blue area” state, not a “red area” Texas, Utah or SoCal. TPP will reign in the Agenda 21 North American Union. Take down the borders, both north and south, and no more sovereignty. We were once the model of a Constitutional Republic. The reason we are different than Greece is; the Fed can print unlimited money for the banks. No news from corporate media as to the incredible struggles of survival Greeks are enduring. Thanks so much for your great guest and the “heads up” warning! I was listening to BBC radio yesterday (Lord Forgive Me! ), & one of the hosts of the show described Israel having Nuclear Arms as “A Conspiracy Theory”. My jaw dropped to the ground, & I pondered the millions listening who would just have swallowed that. in a World brought Low. Why do you presume that gawd did NOT tell 6 or more of the passengers in the Clown Car to run for President? You don’t think gawd enjoys a good long-running comedy show?